Back-to-school motivation from some dapper Dans as kids enter first day of school. Go shawty…it’s a school day…we gonna cheer ya on while you stud-yyy. Okay, that’s likely not what nearly 100 black Hartford, CT-based businessmen were chanting as local kids attended their first day of school on Tuesday. 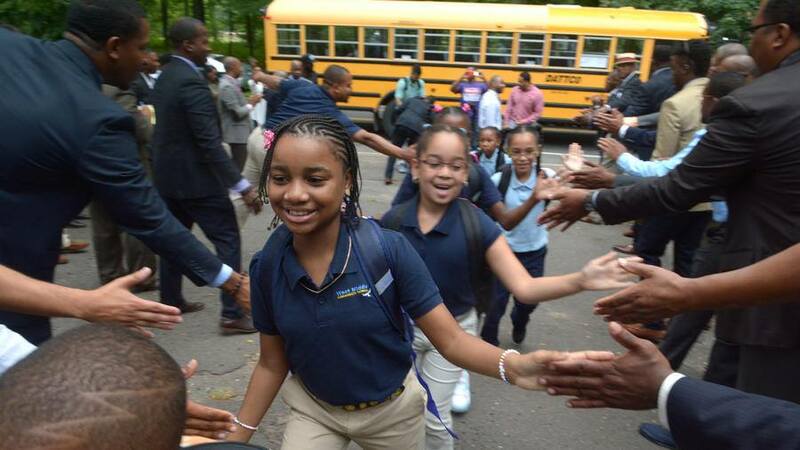 The kids–mostly from single-parent homes–were greeted by a tribe (it takes a village, remember) of lawyers, cops, politicians, artists, activists commemorating the back-to-school milestone with high-fives and applause lined up outside their school. As if they were on the starting lineup of the UConn Huskies rather than elementary students entering Martin Luther King Junior School. Simultaneously, the same scene was recreated at Simpson Waverly School, a half-mile away. Local pastor AJ Johnson, pal DeVaughn Ward and community activist Maurice Eastwood banded together to turn an idea on social media into a reality. Pastor Johnson says the idea was to get 200 Black men to the elementary schools to give kids an inspiring welcome that could foster them throughout the year.